Have you ever gone fishing with a kid? Nothing beats the thrill of taking a kid (or kids) fishing. It’s so rewarding to see them smiling and laughing and sense their excitement as they are reeling fish through the hole. I have always thought it good to expose kids to the outdoors and encourage appreciation of nature and wildlife. It’s a whole different experience and set of skills kids use when fishing vs. working or playing on computers or smart phones. 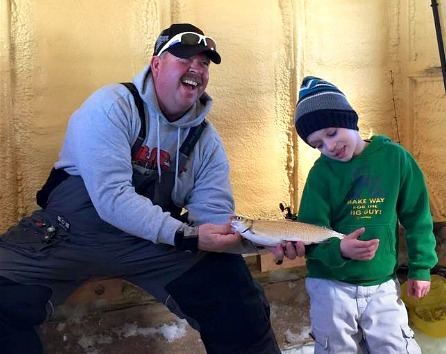 We see kids talking and asking questions when they fish, and we also see them learning how to pass the time observing what’s happening around them. It’s also an exercise in patience and reward (the reward of catching dinner for the family!) and when parents accompany their kids, we see them bonding and communicating on a whole different level. I think kids are the future of our sport and of nature and the outdoors. Without the appreciation and respect they gain on the water, this great, relaxing and truly rewarding sport will fall to the wayside and become a thing of the past. SO: Take a kid (or kids) FISHING TODAY!